The Seek Thermal XR Camera is perfect for those times when your visibility might be obscured. Boating enthusiasts, outdoor adventurers, hunters, homeowners and more can enjoy the benefits of this camera that easily attaches to your Android or iPhone using a simple lightning connector. Now you can buy the Seek Thermal XR with fast international shipping from Big Apple Buddy. What is the Seek Thermal XR Camera? Although it stands at less than two inches high, less than one inch wide, and weighs a mere 13.6 ounces, the Seek Thermal XR Camera is packed with features. It has more than 32,000 individual pixels that can detect heat ranges from as close as 8 inches to as far away as 2,000 feet. The Seek Thermal XR Camera has five convenient modes that make it easy to use it in all lighting conditions, ranging from broad daylight to total darkness. Recording video is a breeze with this thermal camera, and a feature that many stand-alone IR cameras don't have. The adjustable lens and 20 degree field of view, combined with the 206 x 156 array make the Seek Thermal XR Camera the perfect infrared product for sophisticated users. Why Do I Need the Seek Thermal XR Camera? Beyond the desire to play the next James Bond, there are practical uses for the Seek Thermal. Check and see if your dog really is getting up on your new couch while you're at work. Or discover what kind of creature is rustling around in the grass up ahead so you can decide if you need to make a hasty retreat. Wondering what your kids are doing in their room while they are supposed to be sleeping? The thermal+ mode of the Seek Thermal XR Camera allows you to split the screen so you can easily determine exactly where you are looking. At around US$299, the Seek Thermal XR Camera has a better price tag than most hand-held units. 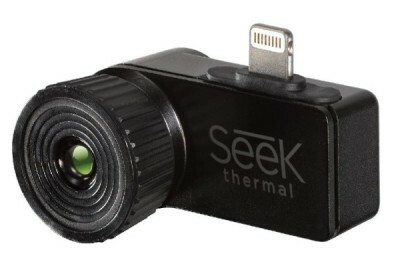 Attach the Seek Thermal XR Camera to your Apple or Android phone’s USB port or lightning connector. Use the Seek Thermal app to control the camera so that you can find and record whatever you want. When you finish taking your photo, remove the camera, store it in the small plastic case and slip it into your pocket. How can I buy the Seek Thermal XR Camera with International Shipping? Unfortunately, the Seek Thermal store does not currently offer direct international shipping. However, Big Apple Buddy can help you buy the Seek Thermal XR Camera and ship it to your doorstep no matter which country you live in. We offer international shipping to over 110 countries including Australia, South Africa, Germany, Thailand, France, Italy, UK, Spain, the Netherlands, Norway, Switzerland, Hong Kong, and South Korea. If you’re interested in buying the Seek Thermal XR Camera, simply get in touch with us for a free shipping quote.